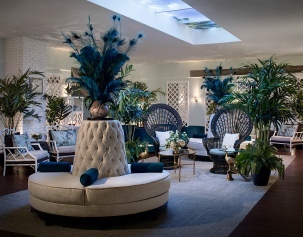 A new 16,360 sf deluxe spa in West Hollywood featuring a custom blend Alchemy Bar, Conservatory for mini-services, a Nail Care Salon with Steam Pedicures, Style Blow Dry Bar, quiet room, 15 Massage and 6 Facial care treatment rooms. Separate men’s and women’s spa areas feature 11,000 gal. jacuzzi spa pools, steam and sauna rooms, misting room, cold deluge area and locker rooms.